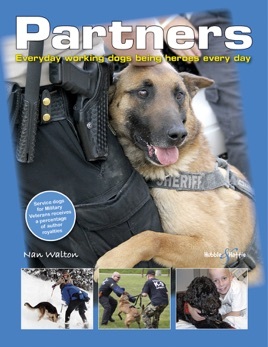 Partners celebrates the diversity of the canine contribution to our species, providing the reader with heart-warming stories of loyalty, perseverance and courage. Written by people that learned to trust their lives to the senses of a dog, and highlighting true examples of working dog behaviour, it enables all dog lovers to understand the inborn senses and instincts of their dog, which man can shape to his benefit. Instincts tie these stories together: Bart finding a child lost on a mountain, Traveler pulling his blind partner from the path of a moving car, and Truman soothing the souls of abused children. With specific explanations of physiological attributes and innate characteristics – such as olfactory prowess, survival instincts, and intelligent disobedience – plus quotes from fifty canine professionals chronicling working dog behaviors, Partners demonstrates the similarities between the behaviour of a tender Cocker Spaniel that brought an abused child back to reality, and a tough law enforcement K9 that assured his handlers safety. This is the story Partners delivers – unity.